This is part five of a five-part series. For part one, click here. Good morning, students. Welcome to your Mitching Independent Study, Hypothetical Mitchery. If you've been following along all week, since Mitching 101, you will have noticed something. Halfway through the lecture on day two, Advanced Mitching, the quality of the Mitch underwent a sea change. Prior to this shift, the Mitches had all been fairly simple, straightforward affairs: multiple declarations of identity, a few scattered details regarding soiling oneself, the first comment by the actual author, and that was it. After the shift, the Mitches became more ornate, longer; they went from simple paragraphs to narrative descriptions containing hundreds of words, and introducing many of the advanced techniques that we've covered this week. What brought about this sea change? 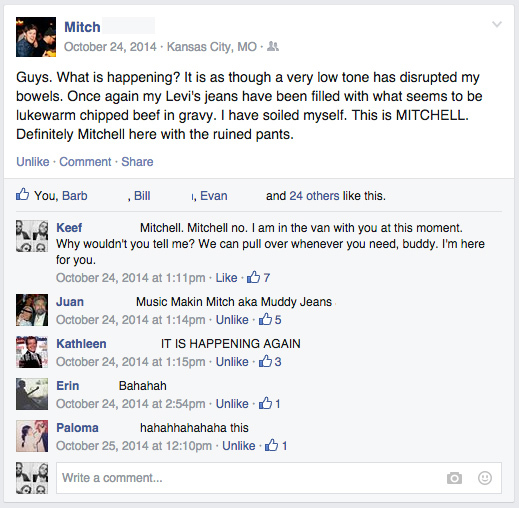 Hypothetical Mitchery is: the act of sharing concepts, ideas, and examples of fake Facebook posts about crapping your pants with a group of friends with no intention of actually posting them on anyone's Facebook wall. As you can see from this exchange, it started out pretty basic. We were just trying to make each other laugh. Why, this was a stellar example of Hypothetical Mitchery. We all felt like we needed to ramp up to compete. With a fair amount of success, if I do say so myself. A lot of the fun here was that at any time, one's phone could ding, and one could discover a fresh entry. Hey guys. Keef here. You won't believe the day I'm having! Sometimes I like to take bubble baths. Not, like, with Mr. Bubble. I'm way more into those fancy smelling bath balls from the Bath & Bodyworks. Especially the Lavender scented ones. Anyway, I had a busy day out on the town and stopped during errands for a big 'ol bowl of chili at this little gas station I know. They have all sorts of wonderful things, but they always have a piping hot vat of Texas style chili and a crock pot of Queso that you can top it off with. If you're feeling especially adventurous (and I often am, because I am Keef, you guys) you can fill up one of those insulated BIG CHUG MUGS full of chili and then go about your day. So that's what I did. I ate that BIG CHUG MUG full of chili on the drive home listening to some podcasts about Donald Trump's hair piece and noticed a spot of creeping indigestion. Such are life's penalties when you consume an entire BIG CHUG MUG full of Gas Station Chili. I was sitting at a stop light when I felt the second pang of indigestion and tapped the steering wheel all the way home, where I proceeded to run myself a hot bath full of lavender bubbles. The bathroom smelled quite nice and I proceeded to make myself comfortable and unwind. That's when the third pang of indigestion hit. I was daydreaming and it took me completely unawares. But it felt like somebody reached into my belly and grabbed my stomach like they were choking it. I sat up straight in the tub, but since it was full of hot water, slid and hit my head on the back of the bath tub. That's when the fourth pang hit. Only that's when I learned it wasn't indigestion: welcome to Brown Town, population: me. 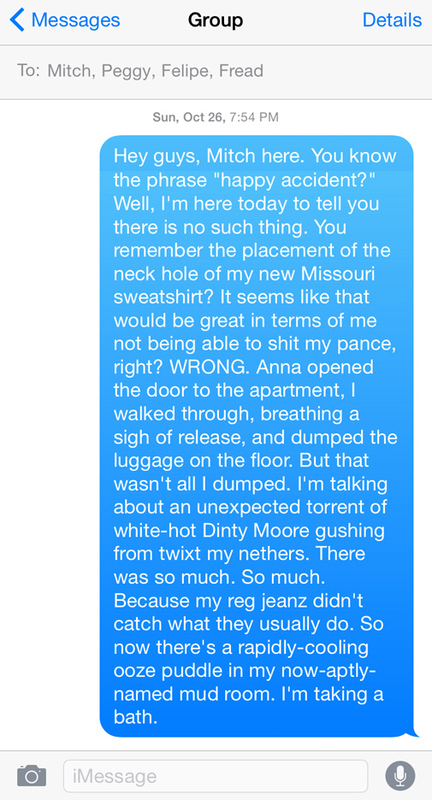 I was still coming to when I realized something was horribly wrong. There was a scent in the air that reminded me of something but what was it? OH GOD NO. THE BIG CHUG MUG FULL OF CHILI. Only now i'd painted the bath tub faucet and surrounding tile with it! The walls dripped brown and the bathroom smelled like BIG CHUG MUG and Lavender. I struggled to get to my feet, but slipped in the water right as explosion #2 left a hole of beans and meat in the bubbles. By this point my doodoofeces were all over the bathroom and covering my body. There was doodoofeces in my hair. I even got a little in my mouth. I kept trying to get out of the bathtub, but kept slipping and sloshing it around more and my body kept expelling more and more and more of the BIG CHUG MUG FULL OF CHILI all around the bathroom! I finally managed to break free from the tub, but once again slipped, this time on the floor, and cracked my head on the toilet. My body continued to expel the BIG CHUG MUG all over the bathroom. I wasn't even awake for most of it. Anyway, my wife came home and while I'd like to tell you I'm sleeping on the couch tonight, I've actually been locked in the bathroom. Send help. Pleeeeeeease. This is Keef. You. Guys. Oh god. It almost makes me sad to share this with you, as this would have been a marvelous addition to my Facebook wall. Luckily for you, I care about your education-- so there it is. Now, the time has come to make an announcement. 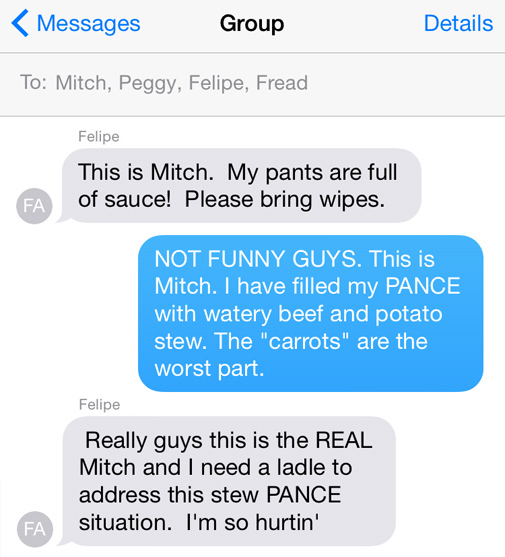 With this most recent back-and-forth of full-pance prankery, I firmly believe that I have reached my personal pinnacle-- my last fake Facebook post about Mitch crapping his pants was the zenith, the highest mountain; truly dizzying heights of doodoo descriptors. From this vantage, there is only one direction to go. In lieu of going in that direction, I am announcing my retirement. I'm leaving on top. Never again shall I grace anyone's Facebook page with a Mitch. It's your turn. 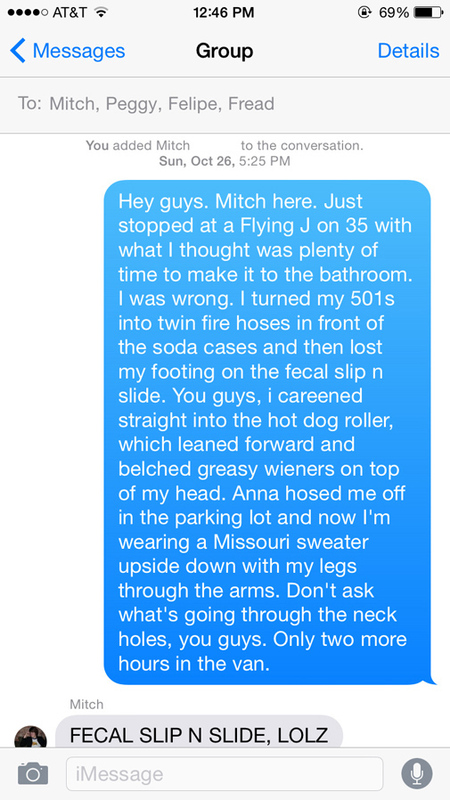 I encourage all of you to take your new skill sets, go out there, and Mitch some of your friends. Start out slow-- perhaps some Hypothetical Mitchery, to get a taste for it, and to discover your individual style. Then, go forth and shoulder-surf, and lay waste to your opponents' social media outlets. 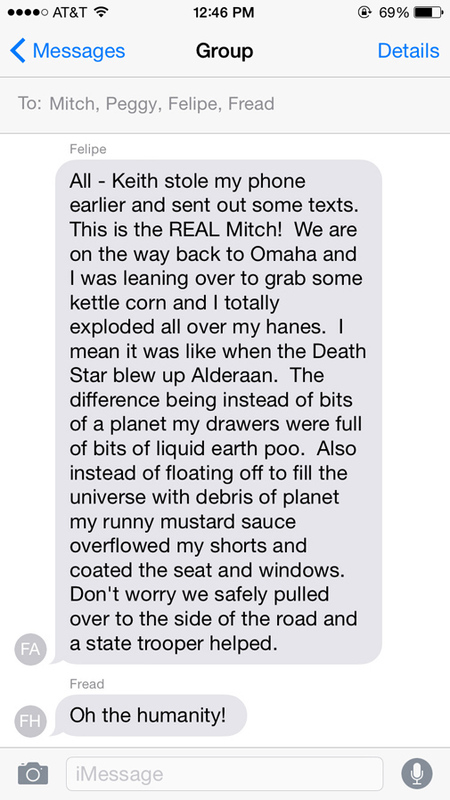 This is totally Keef, you guys. Good day.